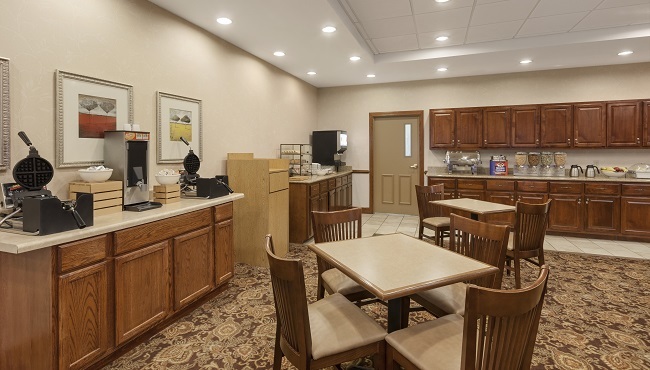 Each morning of your stay at the Country Inn & Suites, Princeton, you can treat yourself to a freshly made waffle, fruit, bacon and scrambled eggs from our dining room. Since you don’t have to drive to breakfast, pour yourself a second cup of gourmet coffee and linger over a copy of the free weekday newspaper. For lunch or dinner, head to nearby restaurants like Campestre Mexican Grill for authentic Mexican dishes or Cracker Barrel for comfort-food favorites. With our rotating menu, you’ll never get bored with your morning meal. Enjoy scrambled eggs, bacon and French toast on one day and then cheese omelets, link sausage, and biscuits and gravy the next. Please contact our hotel within one month of arrival for specific menu options based on when you’re staying with us. Mon-Fri, 6:30 a.m. - 10:30 a.m.